In an article with Card Player Magazine, online poker legend Dusty “Leatherass” Schmidt told the publication how he foresees leaner earnings for online poker pros in the future. 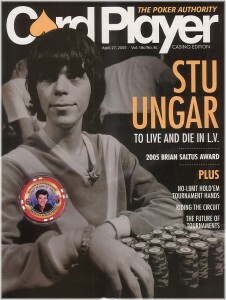 Schmidt explained to Card Player magazine that the ratio of poker pros to poker players is decreasing, which is making it harder to find “juicy” games. Schmidt went on to say how in the past there were maybe 30 regulars in the games he played, and it was easy to keep detailed notes on them; now he has a list of over 500 regulars, and it’s practically impossible to have a good read on all of them. Schmidt is hoping that the possibility that online poker may be legalized in the US will bring in enough new players to once again make the games softer, and bring the ratio of poker pros to casual players back down to the levels we have seen in the past. And if anyone is looking to try there luck at the Online Casino’s to increase their earnings as online poker gets harder, check out Netent Casino. This entry was posted on Thursday, April 22nd, 2010 at 10:05 am and is filed under Poker News. You can follow any responses to this entry through the RSS 2.0 feed. You can leave a response, or trackback from your own site.